Dustin and his team are consummate professionals. They respond promptly, identify any problems accurately, and fix them correctly--the first time. I'll never call anyone else, and neither should you. Wonderful company! Tony (I hope I have his name correct) just quickly identified the problem and corrected it. Gave some helpful advice on how to efficiently warm my townhome. I truly appreciate the professional work from him and Elite Air! Thank you again! Morgan in office very Polite and a Pro. Chris who came to house also a Pro and Very Kind. Spent time explaining Air Flow. Elite Air will be our go to for Heat-AC in future. Thank you for Great Service. Love to support Local Business. We have had a commercial service agreement in place with Elite Air for a few years now, and the savings is in the service. With the thorough seasonal check our system gets and follow up on any issue found we have had to replace less units and the ones we did need to get were installed cleanly and quickly. Great Customer Service! These guys are fantastic. My general contractor recommended them when my HVAC failed. I got the full system (A/C & Furnace) w/Aprilaire Humidifier and the ultraviolet light. It works like a champ and has saved us between $600 - $800 a year on gas & electric. The fan is extra quiet, and I love the wireless thermostat. Last night, my humidifier kept running water, so I called Elite Air this morning. They came out within 4 hours of my call and found that one of the 'o' gaskets was leaking. 10 minutes later, it was back up and running -- no charge! I would highly recommend this company to anyone! According to their website, Elite Air's mission is to be friendly and provide exceptional service. For my problem, a shorted out compressor in the heat pump in the dead of winter and the first time using Elite Air, they fulfilled that mission statement and impressed me most favorably with quality workmanship and creative thinking. Dustin diagnosed my all-electric heat pump system, found the cause for the shorted compressor, and had a dual-fuel furnace/heat pump installed the following week! As the others have all stated on this Testimonials page, Dustin is so refreshing to work with, he's honest and frank about describing what you need and don't need. We are his advertising because the work speaks for itself. The guys at Elite did an awesome job. The techs worked quickly and professionally. Top notch service, Dustin and the Guy's at Elite will treat you right! Awesome service always! Dustin is very knowledgeable and all of his technicians are friendly and professional. I've referred him to many and no one has ever been disappointed. I can't recommend Zach & Elite Air more! Serviced central system to great working order then fixed our gas fireplace that I've been fighting with for 5 years! Top notch professional and customer service, truly Elite! Just had a new 18 Seer RUUD heat pump installed by Elite Air. Dustin and Jason did an outstanding job on the install. And the install is the most critical part. Professional and a true hvac expert, the job was done with pride and precision. Floor protectors on the feet, everything was squared away and done right. I have actually installed my own before so I know just enough to tell the difference. And after 5 estimates with different companies and several brands to chose from I chose Elite Air for the job. I believe I made the right choice. I wanted to take a minute to let everybody know how satisfied I was with the service and installation of my new HVAC system by Elite Air. Dustin and Jason did an amazing job and went the extra mile to make sure that things were properly done as if they were installing it in their own home. This is a company that you can trust is always giving you the best deal possible and quality workmanship. Thank you guys! Dustin and all the crew at Elite Air are awesome and go above and beyond on the quality of their work and the follow-up to make sure you are satisfied. They have replaced all our duct work as well as fixed our AC motor and on both jobs they treated it like they would their own house. Look forward to working with them in the future. Thanks Dustin and co. I have worked with Dustin and his exceptional crew for four years now. I can't recommend them enough. By far, the best contractor I've ever worked with and my clients have never had anything but high praise for them. Not only do they do great work, but I find them to be extremely competitive in the market! Elite Air installed a new 14 SEER HVAC compressor and handler for thousands of dollars less than two other large area contractors. The new units are top quality, and run quieter and are performing much better than the old units. Justin, Jason and Markus all did a superb job of installing the new system. We are very satisfied with our new team and can say that they are the best HVAC people we have ever had. Call for all you HVAC needs! My a/c went down and Dustin had me back and running the next morning! Dustin does amazing work! Love working with a company that takes pride in what they do!! Good honest people. 5 MILLION STARS!!!!! We've worked with Dustin and his crew for years now and Elite is the BEST most HONEST, DEPENDABLE and PROFESSIONAL company I have EVER worked with. Dustin is friendly and extremely knowledgeable. We feel like we have a friend in our home when he is here. We called him on New Years Eve Day (sadly enough) and he had our heat all fixed up within two hours from our call to him. In ADDITION we have him check a unit that had been quoted at $3,500 repair from another company (crooks) and there was NOTHING WRONG with that unit!!!!!! You will never ever go wrong calling ELITE!!!!!! Great company ran by great people! I found my new HVAC company for sure. Couldn't ask for better service. Dustin and Jason did a fantastic job for me. Dustin was awesome! Went above and beyond and got our problem fixed in about 5 minutes! Super friendly and fast, professional service! Highly recommend! Where to start? We got a quote from a rival company to fix our AC system that would have devastated us financially. We were told by a friend to contact Elite Air and I couldn't be more pleased with the results. Not only did he save us literally thousands of dollars, but he was knowledgeable, friendly, and good with our 1 & 3 year olds. He not only took the time out to explain to us what was going on, but he was also patient and very well informed. I would 100% recommend and we are so grateful that we decided to get a second opinion. Thank you so much! Dustin from Elite Heating Air came to our home after business hours to fix our HVAC when it wouldn't light. He gave us a temporary fix so our family would have heat in the middle of winter, stayed until we ordered that part we needed and came back to install it the day we received the part. He was very professional and I would recommend d Dustin and his company to anyone in need of HVAC services! Dustin is INCREDIBLE. After describing my AC issues over the phone (on a Friday afternoon at 4pm when everyone else was closed) he came over within a couple hours to diagnose our furnace issue. He knew immediately what the problem was and promptly began to fix the issue. I'm usually the one in my family to troubleshoot the AC and try to fix it with YouTube videos, so I was interested in the process, and he professionally explained what he was doing and the reason and kept me in the loop along the way. Within an hour and a half we had running cold air!! I was so impressed with the fix and that it was able to be fixed the same day. Dustin was also super friendly and I'm so thankful he was able to fix our AC from 6-8pm on a FRIDAY. Thank you Elite Air. I recommend them highly. We have had issues for years with our HVAC system, and have had tons of different companies come through to fix various issues. This time it was a issue with our heat, it was not working. I called Elite Air and even though it was Thanksgiving weekend they had everything fixed and working within a few hours. No other company has been as professional, knowledgeable, and fair as Elite Air. Highly recommend them for any HVAC issues. Great service. Fast repair and easy to deal with. Highly recommend. Great service and fast as well! Will recommend to everyone. Contacted Elite in the morning with a problem with my A/C. They went out of their way to fit me in that afternoon. Problem fixed right away and didn't try to sell any extra services like the bigger companies. The service tech was super friendly and knowledgable. Even if I had to wait these guys are worth it. You can trust they will diagnose and make the repair correctly and to me that's what sets these guys apart. And all of this with the bill being much lower than expected. I will be passing on their name to all of my plumbing customers who need HVAC service! Definitely will be recommending to everyone from here on out! Our heat went out very early in the morning and Dustin was out that night to give us an estimate on a new system. From the start they were all extremely professional and did not mind taking the time to explain every little thing to us through out the entire process. I have two very close friends working in the HVAC industry and their companies could not even come close to what Elite Air offered us in terms of service, equipment, pricing and warranty. That alone spoke volumes to me! We are 100% confident in the choice we made! We came home from vacation to one of units not working and after calling a few companies, Elite was the only one to actually answer the phone. They were out to us quickly and did a great job. Very professional and will definitely use again! Elite put in a new HVAC system for me. They are reasonably priced and stand by their work. 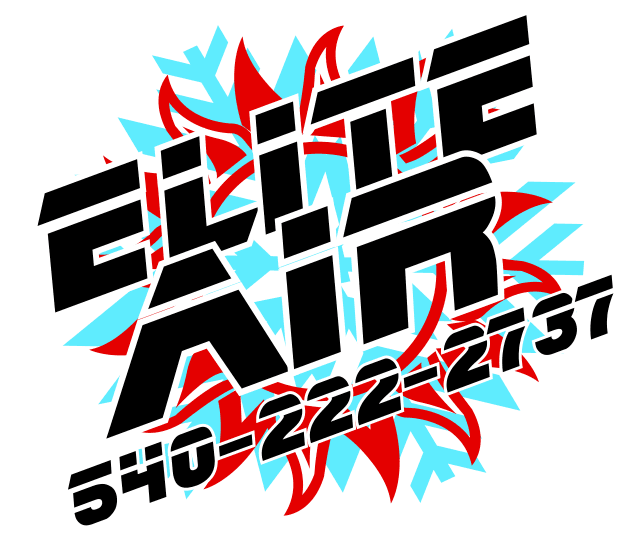 We had an EXCELLENT experience with Elite Air, who came as a referral from a friend. They responded very quickly and were great to work with. We would gladly use them again. Five Stars. We have used Elite Air on three occasions so far. The first was to replace our central air conditioner, the second was to do dryer duct cleaning, and the third time to replace a water heater and kitchen faucet. Their pricing is good, they provide excellent customer service, and their technicians are on-time, knowledgeable, respectful of your property, clean up after themselves, and are very friendly. It is not often that one gets to say it is a pleasure to do business with a firm. Five Stars. We have used Elite Air on three occasions so far in 2018. The first was to replace our central air conditioner, the second was to do dryer duct cleaning, and the third time was to replace a water heater and kitchen faucet. Their pricing is good, they provide excellent customer service, and their technicians are on-time, knowledgeable, respectful of your property, clean up after themselves, and are very friendly. It is not often that one gets to say it is a pleasure to do business with a firm.